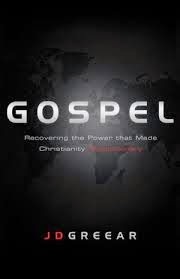 One was called Gospel: Recovering the power that made Christianity Revolutionary, by J D Greear. This is a very helpful summary of what lies behind a Christian's motivation. He begins..
Greear structures his book around what he calls a gospel prayer, which can usefully be said and mused upon daily. In speaking to God,. 'In Christ there is nothing I can do that you will you love me more, and nothing I have done that makes you love me less.....Your presence and approval are all I need for everlasting joy......As you have been to me so I will be to others....As I pray, I'll measure your compassion by the cross, and your power by the resurrection. A really helpful prayer to chew over and a great book to have read at the start of the new year. 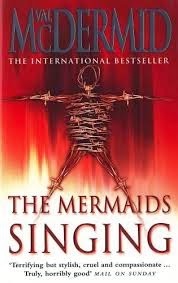 In complete contrast I also read The Mermaids Singing by Val Mcdermid. In the Spring Biddy and I are taking a short course on Female crime writers, and this is one of the set books. I generally enjoy the genre, particularly enjoying Mankell's Wallender series and Peter James 'Dead' series. However I do tend to steer clear of the especially violent, graphic and 'nasty', enjoying the police procedural detection aspect, whilst also the suspense thriller aspect. The Mermaids singing tested me! There is certainly nastiness in abundance and a fair amount of sexually graphic language. At times I wondered just how valuable it was to be reading and indeed even 'enjoying' the read. It's certainly gripping and I finished it in no time. Now I've had a chance to reflect upon the read I've wondered just how Christian believers cope who are exposed to the sheer evil that sometimes shows itself above our respectable exterior. In other words, how to forensic pathologists and psychiatrists, and murder squad detectives-who are Christian believers-reconcile their work with the encouragement to 'thinking upon lovely things' that the apostle Paul encourages? I'd love to ask them, for surely we want Christ to be honoured and 'present' in as many walks of life a spossible. At any rate the book certainly lifts the lid on a degree of evil which many in our society would suspect is only present but not acted upon except in a tiny minority. The sexism, interpersonal conflict, petty jealousies, quickness to judge others, frustrations and more of 'normal' life are woven throughout the book and remind us all of our need saving from ourselves, even if the need appears less dramatic than that of the 'evil' character at the center of the book. Just a few good things of 2014 (mostly books).